If you have a home in Bay Village, Ohio, you’re in one of the most desirable locations in Cuyahoga County—and that fact helps spur property owners to take pride in their homes. Accordingly, kitchen remodeling is one project Bay Village homeowners make a top priority to enhance their home’s value and to enjoy the amenities of a state-of-the-art kitchen. 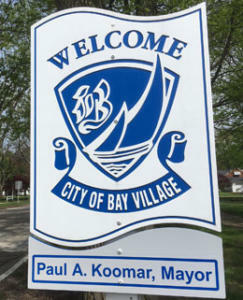 Bay Village became a city in 1950, but the post-World War II housing boom was well underway by then. While many residences were built in the 1950s, most of those did not include spacious kitchens. So, many homes built in those years had what are often called good, solid “bones,” and the kitchens were built to be sturdy as well, but on the smaller side. By the time these homes, and indeed even older ones, started to show their age, consumers demanded kitchens that would make more efficient use of space. Or if that option was not available, consumers favored enlarging the space by taking out a wall to provide needed space. Kitchen remodeling begins with a design, of which there are five basic types: galley, single-wall, L-shape, G-shape and U-shape. 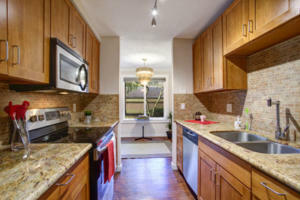 Galley and single-wall are most common for small kitchens, up to about 150 square feet in size. The galley design uses two counters, parallel to each other, with a traffic path between them. Many designs place the sink, stove and refrigerator along one wall, with the other wall as working space. But nearly an equal number of designs configure the stove along one wall and the sink and refrigerator on the other or vice versa. 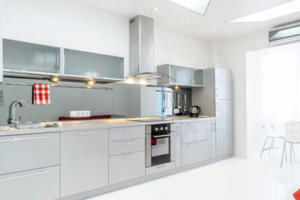 A key design point is to position the sink, stove and refrigerator in a triangle formation. This allows for efficient use of space. The cook can reach the refrigerator, stove and sink by taking only a step or two. Dishwashers are uniformly positioned next to the sink, for convenient connection to water lines and drains, and this adds to efficient use of space. One drawback of the galley kitchen is that the space between counters often serves as a major passageway for visitors or family. This may interfere with the cook-at-work, unless there is another way people may reach other parts of the house by not going through the kitchen. A single-wall design works well in small kitchens, since it can fit into nearly any space. Basically, the refrigerator, sink and stove are on one wall, only a short distance apart. The opposite wall would provide space for a small kitchen table. One of the more popular designs is the L-shape kitchen, known for its ability to provide a corner workspace away from the kitchen activity flow. This is ideal if there is no room for an island. However, his design may make it difficult if there is more than one cook—elbow room will be at a premium and could prove a bit frustrating. The U-shape kitchen is a flexible for most any size of kitchen design, but especially for those incorporating an island. Depending upon consumer preference and access to plumbing lines, a sink may be built into the island. The U-shape kitchen design includes two parallel walls and a third perpendicular wall. Appliances can be configured so there may be one or two to each wall. When cabinets are considered, it’s a good idea to make the corner ones accessible by using a lazy susan or a blind cabinet solution. These often have a half-moon pivot shelf or pull-out rack that uses space conveniently that otherwise would have been inaccessible. A G-shape kitchen is similar to a U-shape design, but adds an additional countertop, often called a “peninsula.” This short counter extends from one side, and may be used as a breakfast nook or a bar, with stools for seating. 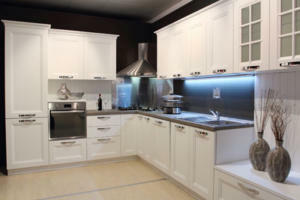 It can also provide extra counter and cabinet space. This kitchen design works for medium and large kitchens; small kitchens would not have enough space for an effective peninsula. With the help of design software, planners have many options at their fingers to revise and customize the kitchen layout. Renderings in 3-D are the rule, allowing a virtual look at the finished project without the first nail having to be hammered down. 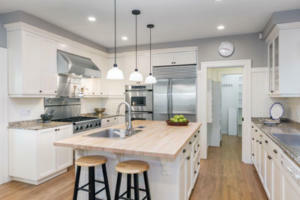 It’s a fun experience to plan a new kitchen—it takes time but the finished project is well worth the effort. In business for more than 40 years, Sciarappa Construction offers creative quality and premier-level craftsmanship that leave clients and excited about their kitchens and “Heart-of-the-Home” living space. Take the first step in kitchen remodeling by contacting Sciarappa Construction at (440) 930-2882 or by email at info@sciarappaconstruction.com. We’re located at 32961 Pin Oak Pkwy., Avon Lake, OH 44012.